This Friday night, if you don’t want to head on out to your favorite Supper Club, why not stay in and make this classic dish at home! You don’t have to go out to enjoy a delicious meal of fried fish. 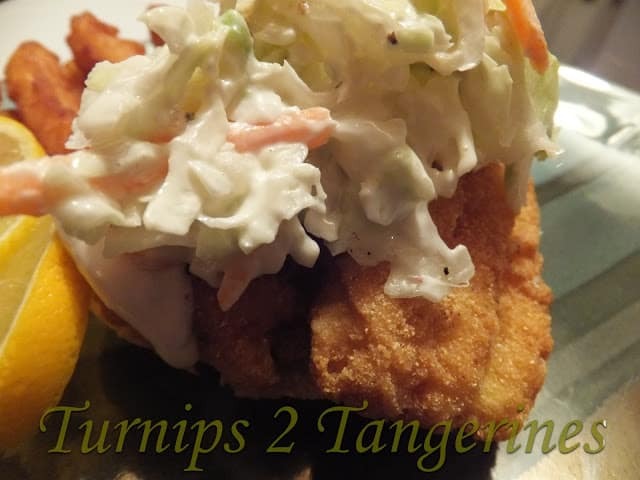 Serve with creamy slaw, tartar sauce, french fries, buttered rye bread and lemon wedges for a true Wisconsin experience. PS: Don’t forget the ice cold Wisconsin Beer! My family loves an ice, cold Leinenkugel. Our neighbor is an avid hunter and fisherman. Last week, he stopped by and gave us some wonderful perch fillets. I can’t tell you how many times a neighbor or up north friend will stop by with venison, duck or rabbit. One thing we very seldom get is fish. Fish is a rare commodity here, so when someone gives you fish, you’re in for a real treat. I have to admit, the perch fillets were the best! Nothing beats the flavor of fresh fish caught right in the lake I live on. The places that have a beer sign hanging outside advertising beer that they don’t even make any more. The name of the tavern is usually one or two words; “Butch’s,” “One More,” “Cheatin’ Bar.” Somewhere in the front window, you’ll see a sign that reads, “Friday Night Fish Fry Served Here.” If you happen to come across such an establishment, on a Friday, by all means go in!! They will no doubt have the best Friday Night Fish Fry you will ever have eaten in your entire life!…Tell them Mary sent you! Rinse fish in cold water; pat dry. In a shallow bowl, combine the cheese, cracker crumbs, cornmeal, garlic salt, creole seasoning and pepper. In another bowl, beat eggs and beer, dip fish in the egg/beer mixture, then gently roll in the crumb mixture. In a cast iron skillet, heat oil. Fry fish in hot oil for 5 to 7 minutes or until fish flakes easily with a fork. Drain fish on paper towels. *Note: You can substitute; catfish, walleye, bluegill, crappie, or lake trout for the perch. 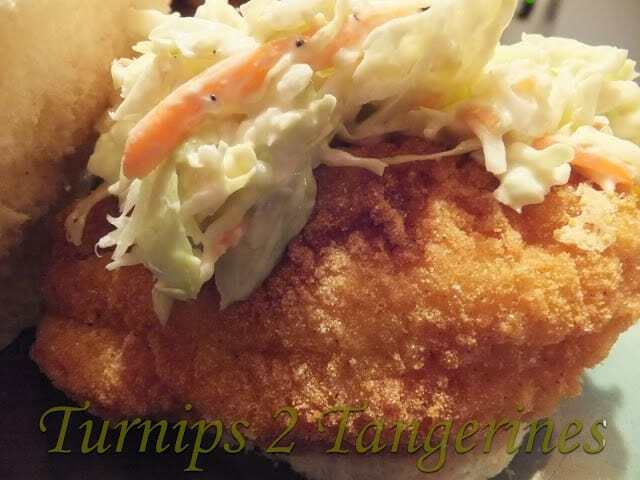 After a delicious meal of pan-fried perch or my personal favorite, perch sandwiches topped with slaw and tarter sauce. Serve bowls of Blueberry Peach Crisp with scoops of vanilla ice cream. Doesn’t get much better than that in my book! I wish I lived on a body of water–I would fish everyday! Well, maybe not everyday, but definitely often. Your (Bob's) perchwiches are just the type of thing I like to do with fish. Love the name too! Thank you for coming by and linking, Lynn. Wonderful! Hope you like it:) Thanks for the follow! That looks perfect! 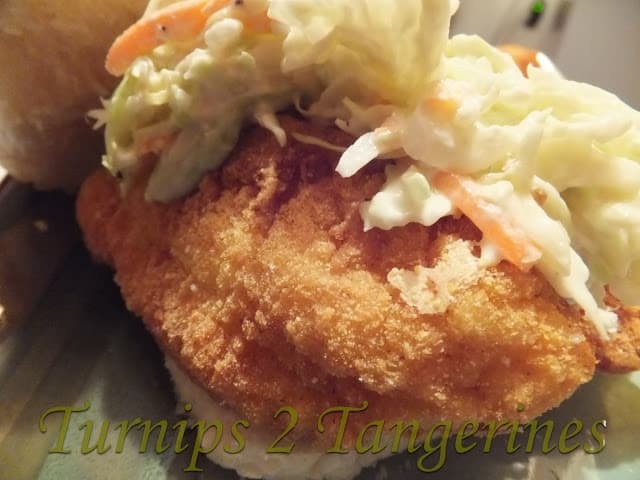 I have some fish I've been needing a recipe for… hmmm.. just liked you back on FB. Yum! This sounds delicious! I'm definitely going to try this recipe, I love fish. Thank you for stopping by my blog today. I'm happy to follow back and try many of your amazing recipes.